I remember that guy i once asked him to play some Hendrix and boy did he give it the works.He could make that guitar talk makes you wonder how he has got on in life. The violinist is Kate. She is presently studying for a Phd in music. I love the Man with two dogs. Not busking as such but a young girl used to often play the harp in Sainsbury's at Moor Allerton Centre. She was excellent but I've not heard of her for some while now. He still busks outside Starbucks on Commercial Street on a Sunday occasionally. He still has the chair where the last dog sat, but there's now a doll on it with a placard saying "Live Music". It's not the same without the howling which accompanied "How much is that doggy in the window?"! 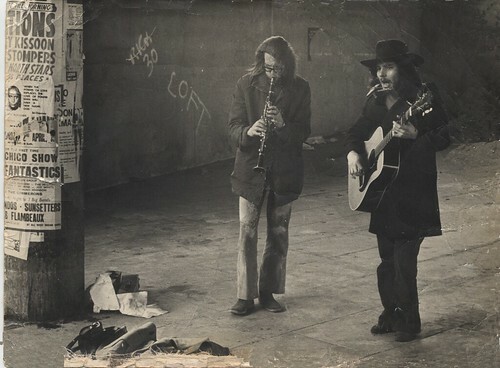 My dad used to do a bit of busking and I think he may have done so when he moved to Leeds in the early 70s. Here's a photo that was taken somewhere in London, possibly around April 1972 judging by a date on one of the posters. He's the guitar player on the right. A few years ago Leeds Centre used to have a trio of very professional Acker Bilk-type blokes. Certainly clarinet and theatrical waistcoats, older middle aged chaps. Occassional vocals from recollection. There is the lady who plays the accordion. She usually sits on Kirkgate near to Briggate. The shall we say not young lady may not be a busker like what most people will think of as a busker, but it would be wrong for me to make assumptions about her personal life situation. In any event she is a regular sight playing the accordion.